*New Product Launch* These attachment handles are meant to be used with our ninja obstacle course. The two included handles can be attached to the connection points in addition to the handles included when you buy the ninja training line. Extra attachment points are included so you can add accessories like climbing ropes, cargo nets and rope ladders in addition to these handles. Be the hit of the neighborhood with this fun, fitness centered activity that promotes balance, coordination and flexibility. This is a great compliment to an extended obstacle course with other challenges or as part of a playground, treehouse or recreation area. This set includes: (1) gymnast ring and (1) trapeze bar. Best Value - two added handles give you the best obstacle course setup possible. A Perfect Gift - Great for birthday parties, Christmas, graduation or any celebration. Convenient Outdoor Fun - Travel bag included for easy handling on any outing. Liv & Jane Co Quality - Satisfaction guaranteed - We are a small company based in Portland Oregon with a focus on happy customers. Kids who love monkey bars or gymnastics won't be able to stop swinging. The adventure never ends. Manufacturer: Liv & Jane Co. Brand: Liv & Jane Co. Publisher: Liv & Jane Co. 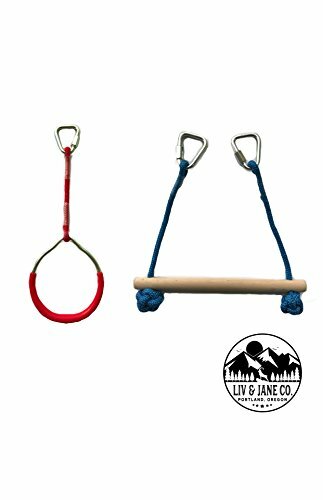 Studio: Liv & Jane Co.
View More In Playground Fitness Equipment. If you have any questions about this product by Liv & Jane Co., contact us by completing and submitting the form below. If you are looking for a specif part number, please include it with your message.